To order any of the Dartmoor Society merchandise below please download and print an order form, fill it in and post it to us with a cheque payable to The Dartmoor Society. A5 in size, 64 pages, full colour, written and compiled by Tom Greeves. 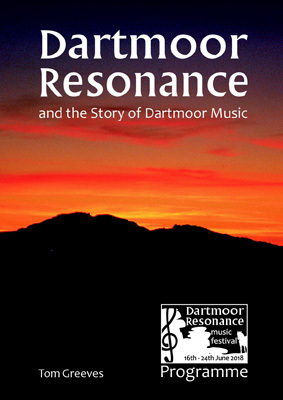 It tells the story of Dartmoor music from prehistory to the present day, as well as giving details of each Dartmoor Resonance Music Festival event, and of the composers, conductors and performers involved. The book will be a lasting legacy of the Festival and an essential Dartmoor reference work for the future. The cost is £4.50 (including p&p). To order, please download and print an order form, fill it in and post it with a cheque to: The Dartmoor Society, PO Box 570, Torquay, TQ1 9JB. Our Fridge Magnets will be available at various local shows, namely Chagford Show, Widecombe Fair, The Letterboxers Meet as well as at some Dartmoor Society events such as the Debate and the Research Lecture. They are available in five beautiful Dartmoor images costing £1.50 each. They can also be purchased by post – please add £1 p&p (for up to 5 magnets). To order, please download and print an order form, fill it in and post it with a cheque to: The Dartmoor Society, PO Box 570, Torquay, TQ1 9JB. Colin Wakeham completed an Audit of Archaeological Features and Structures relating to Railways & Tramways on Dartmoor, funded by the Dartmoor Society in partnership with Dartmoor National Park Authority and Devon County Council. He covered certain moorland tramways and railways – Plymouth & Dartmoor; Princetown; Zeal Tor; and Redlake. His very detailed findings, with maps and photographs, are available on three CDs, boxed together, at a price of £9.50 (including p&p). To order, download and print an order form and send it with payment to: The Dartmoor Society, PO Box 570, Torquay, TQ1 9JB. Page last updated on Thursday 7th February 2019.